Last night we went to my daughters new school to meet her teacher and drop her supplies off. This mommy is having some emotional thoughts as I type this. I am so thrilled and excited for her but kids grow up so quickly and I am trying to hold on to her and keep her little as long as I can. My daughter seemed a bit scared when we approached the school. After we got out of the car she had a death grip on my hand. It was not what I expected because she has been asking to start school and has been so excited thinking about it. Tonight she asked God to help her not be shy or nervous for her first day tomorrow... it melted my heart but I know God will be right there with her guiding and directing her steps. Tomorrow morning is the first day and sadly I have to be at work before her bus even comes. :( The adjustment of working full time is going slowly but it truly is a blessing for me to have this job. I know God has placed me where he wants me! My son has been having a hard time each morning as I leave but I know he will adjust. I am also very blessed to NOT have to put him in full time care. My husbands job allows him to take care of our son and use drop in care as needed. Thankfully my son takes a good nap so my husband can get a lot of his studying and other work then and then we only have drop in care as needed. 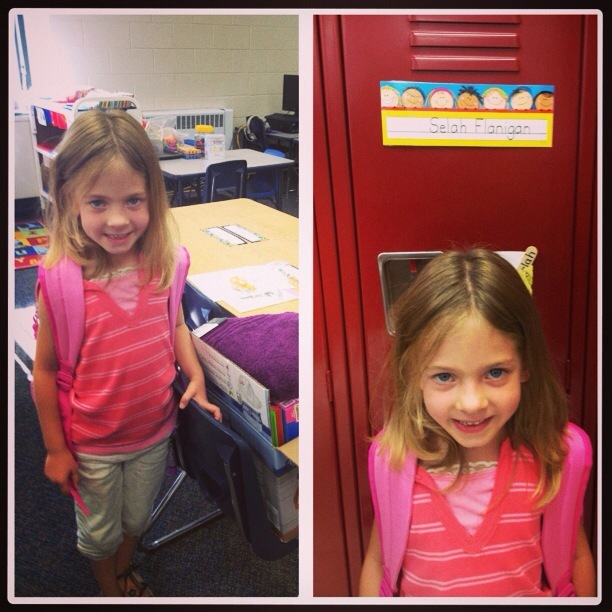 I think my daughter will have a great year! We had a great children's church service last Sunday and we really made some declarations and had a great prayer time covering the whole 2013-2014 school year. Have a blessed 2013-2014 school year! Look for another post later this week showcasing all the first day of school pictures and summary.